Here’s the scenario. You are working on a project with other colleagues. 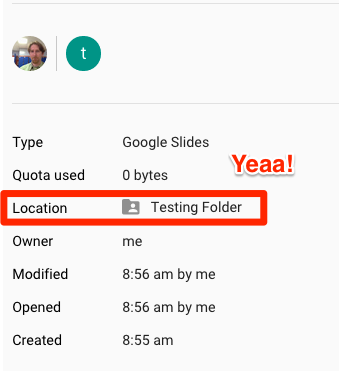 You have a shared folder and several Google Docs inside – also shared to the team. Things are going great. Ideas are being shared, the project is taking shape and best of all everyone is on the same page. Sounds like a dream come true doesn’t it? Most times it is but let me throw you a curve ball. One team member accidentally decides to trash one of the documents. Uh oh! But they weren’t even the owner-how in the hell can this happen? Well folks, it can … kind of. Read on to see it in action and how to fix it. 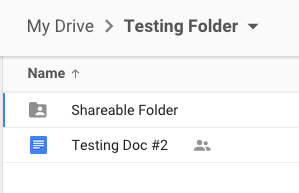 Here I have a folder on my Google Drive and it is shared to a test account. It is only View Only right now. Just as you saw – the test account seems to be able to delete the file. When I go back my account (again, I own all the documents in this account) – it is gone like Keyser Söze. Oh man – that is very scary. Imagine sharing a document with your entire school and someone can trash it at will! It sounds nightmarish but all is not lost. You see, the file is not deleted. It is … somewhere else, but here is where it gets a little weird. If I go through my Google Drive, I cannot find it. It doesn’t seem to show up, not even in the trash, but if I search for it, I can find it. So far this is the only way I can locate the file – no matter how I sort my files or search them manually I cannot find the file, but the search does the trick. Whew – there it is, but the real question is where exactly is it? I honestly have no idea. When you select the file there are two interesting things that happen. One is in the information that you can get from Google Drive. 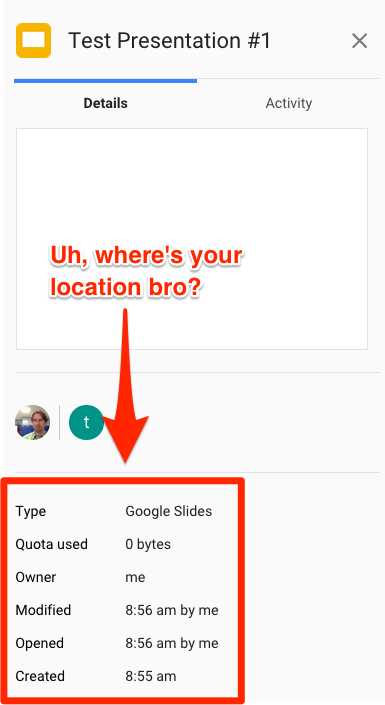 You can see that it does not show you where the location is in Google Drive. Also there is a new option on the toolbar when the file is selected. It gives you the option to add it back to your Drive. This is weird, because it is not in the trash. It’s just somewhere hidden in your drive. Strange huh? So I click that and add it back to my Testing Folder. Now it has a location again. 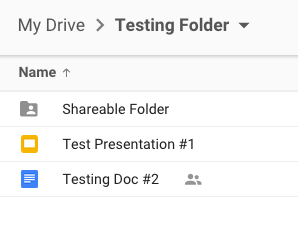 The best explanation I can come up with for this weird behavior is that the folder system in Google Drive is a sham. The folders are just a fancy way of tagging files as opposed to actually organizing the files. The folders are really just filters. Kind of interesting but if you’re lost then don’t worry about it. Just know that if someone trashes a file you own, you can find it, restore and keep on working. UPDATE* THANKS TO URKO MASSE (@urkomasse) FOR THIS TIP! There is another way to find the trashed file and this seems a bit easier. 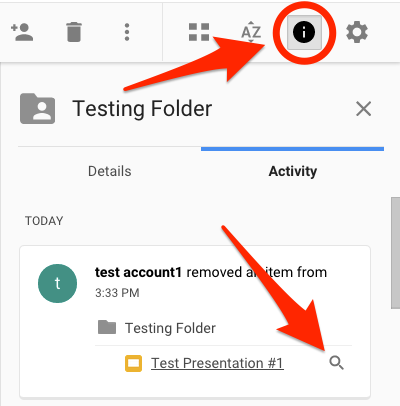 Find the folder on your Google Drive but don’t open it, just select like I did here. Then select the “I” to bring up the information for that folder. Click on “Activity” and you will see who removed the file and when. It also gives you a way to find it by clicking on the magnifying glass I’ve pointed to in the image below. When you click the magnifying glass it performs a search like I did before and voilà! You’ve found your trashed file. Thanks again to Urko Masse for this very helpful tip! This entry was posted in Google Apps, Patrick Cauley and tagged google drive, Permissions, sharing, Trash. Bookmark the permalink. Another way to find that file, is to go to the folder where it used to be, and open the new “Activity” sidebar, just like you did for the restored file itself, but at the folder level. You should be able to see what happened: who deleted it, and even a link to the file to restore it following your instructions. Yes. File / folder inheritance is a bizzaro-world. Last year an issue arose in the middle school where students were able to view files marked private. 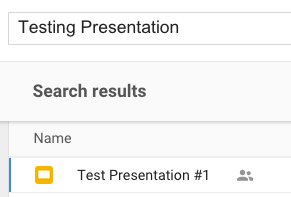 After quite a bit of searching and poking, it seems to me that the default setting on docs is ok; that by default, you need a link to access, and you cannot by default find a document. I logged in as the middle school student, but was unable to find any documents that they should not share. I also logged in as teachers, only looking at documents and sharing settings. I have a folder: top secret. It is private. I have a file: my vacation picture. It is public. Apparently, things become muddy when you have document that /was/ shared and then make it private. A great heads up. I have waded into that muddy mess before while collecting a bunch of resources into one folder and then sharing out the folder. It turned out that some files were shared while others were not. We were talking about 20 files, so it wasn’t too arduous to plow through them individually and manually change permissions, but I was a little surprised that I had to do it at all.